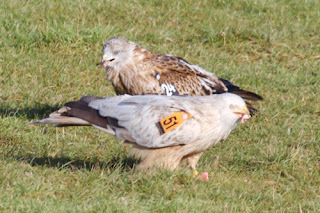 Both the white red kite and a red kite are landing these days. The white kite has been a very regular visitor since the weather got colder. We've snow on the tops of the hills around us, but none any closer, much to the disappointment of the photographers.. The building repairs were almost finished but.. the recent storms have now stripped a section of slates from, what is now, the oldest barn on the farm, so another spell of work is required on its roof..
From now on, as well as these posts being accessible through the gigrin site, just as this is today, they will also be directly on a blog - redkitenews.blogspot.com. 1) The news page has always become far too long before I divided the old posts off onto a new page - mainly because it took time to change all the links from other parts of the site to accommodate the new 'old' new page.. These are now automatically archived so that has anwered that problem. 2) It is now possible to subscribe to the page via the "Subscribe" links on the right so coming to the site and finding that I've added to the pages some time ago, or perhaps not added anything.., can be avoided. All the functions of the blog are now with the site so I hope this extra functionality is helpful. In time I hope to host the blog pages totally within the gigrin site but that's outside my abilities at present!! 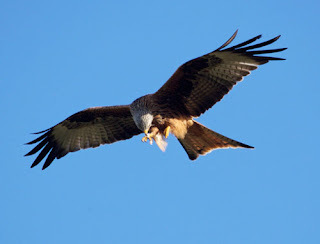 We briefly had a red kite in for rehabilitation due to it being found in the river Ystwyth by Mr Malcom Slater. Apart from its cold ducking, the kite was otherwise in good health so it was tagged and released back into the wild the following day. It was with great relief this morning that I turned on a tap and at last saw water flowing from its spout! We've been without running water for 4 long days and that has meant many many journeys carrying water. Ty Meri, my self catering bungalow was vacant so treks across the field with kettles etc were the order of the day. Temperatures have now risen enough to defrost the water supply pipe - the next job will be to discover where, in its 400m length, it became frozen! It's amazing how many pro photographers we see here now, with the latest to get in touch being from Sweden. Red Kites coming to feed have reached staggering numbers this past week with something approaching 500 on the coldest days (-4 during the day!). The usual Red tractor has been out of commission so our much larger Blue Machine is currently carrying out the meat - the kites are far more wary of this and wait for me to get at least to the other side of the field before descending to take food. Its this time of year that the kites really need this facility and because we feed anything between 250kg and 450kgs per week the kites each have a good chance of picking up food for themselves. Were we to take out only a small bucketful of meat the birds would use up far more energy trying to rob each other than any that would be derived should a bird be lucky enough to take some food.